The first meal of the day is the most important, needless for me to say it for the nth time. May it be breakfast on working days or a rich Sunday brunch spent in the company of family and friends it doesn’t really matter, it’s carbohydrates that make the difference. A proper source of energy, carbohydrates are better to be consumed during the first part of the day mainly because by approaching the night hours our capacity to burn down calories is reduced and this may lead, if carbs are consumed in excess, to an important weight gain. 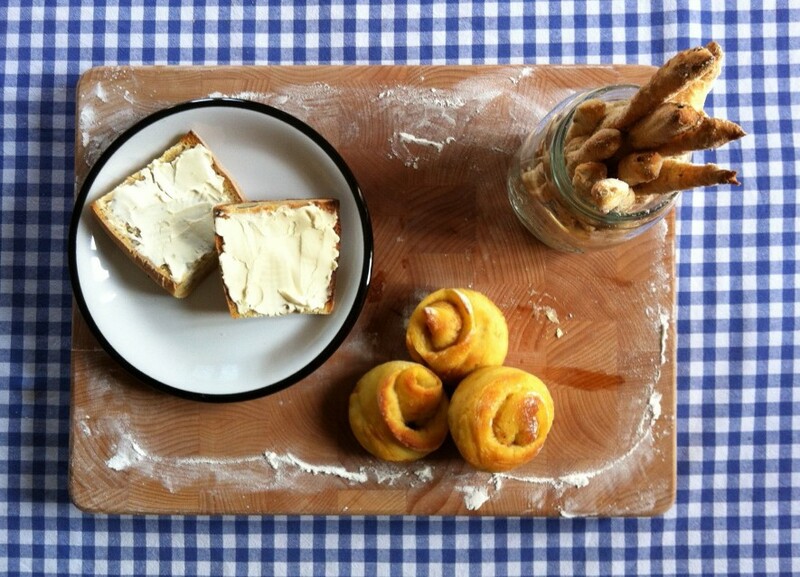 Today’s recipe for Maroggia’s Mill Cookbook is a twist on zwieback, a great classic of Swiss breakfasts. I admit I do prefer them much to their Italian cousins, rusks, which always seem to be inconsistent and unwilling to be properly dunk in tea. For while dunking a rusk in tea it is important not to exceed those five seconds soaking time separating a properly soaked slice from an impalpable slurry which irredeemably splashes in the cup resulting in Pollock splatters all around, staining clothing, tablecloth and newspaper. Zwieback on the other hand are more compact and can be dunk twice. Italy 0 – Switzerland 1. And why not…lets be dragged by a little national pride, roll up our sleeves and accomplices our faithful and reliable Maroggia’s Mill flours let’s bake together these crispy delights! I added whole wheat flour and a pinch of cinnamon to the mixture to differentiate our zwieback from those available on the market, but you can try to make the classic version using only white wheat flour or pick any other combinations of sweet and savoury ingredients to flavour them. For the record this recipe has been subjected to a brunch tests and got top marks from all of my five enthusiastic guinea pigs. What are you waiting for? Ready, steady, bake! I simply love breakfast. Sweet or savoury it makes no difference at all, it’s just one of my favourite meals by virtue of its versatility. I discovered kanelbullar while “bakery hunting” for my morning breakfasts in Copenhagen. Not that i didn’t know well it’s british-american counterpart, the cinnamon bun, but what intrigued me the most was its shape. Braided breads of all sorts have always an effect on me, it must be my aesthetic and artistic inclinations playing a big part in this fascination.